We are a small local husband and wife team. Our commercial kitchen is located in the small agriculture town of Somerton, Arizona. We are located 13 miles north of the Sonora, Mexico border. 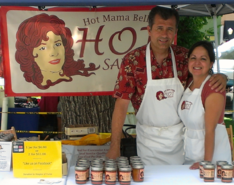 Our mission at Mama Bella Hot Sauce, LLC is to tame the fantastic flavor of the habanero peppers into delicious hot sauces. We guarantee that adding our products to all your favorite foods will enhance their flavor. Somerton is a farming community located in Yuma County Arizona. 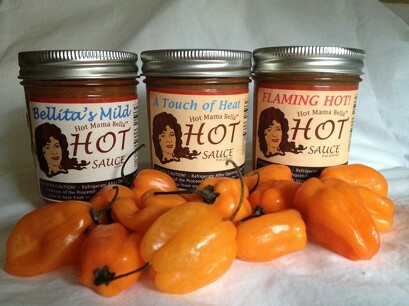 Mama Bella Hot Sauce is authentic and made to enhance your favorite dishes! Mama Bella Hot Sauce, LLC processes three delicious and unique habanero hot sauces: “Flaming Hot”, “A Touch of Heat”, and “Bellita Hot Sauce”. We prepare them for you without preservatives and they are made of all natural ingredients. Our company does not claim to have the hottest habanero sauces in the market but we do claim our hot sauces have the best heat while delivering delicious flavor! Two common denominators we are hearing from our fans is our products are “very addicting” and “good stuff”. For all of you who love flavorful heat– these wonderful habanero hot sauce products are for you. We love making them for your enjoyment!